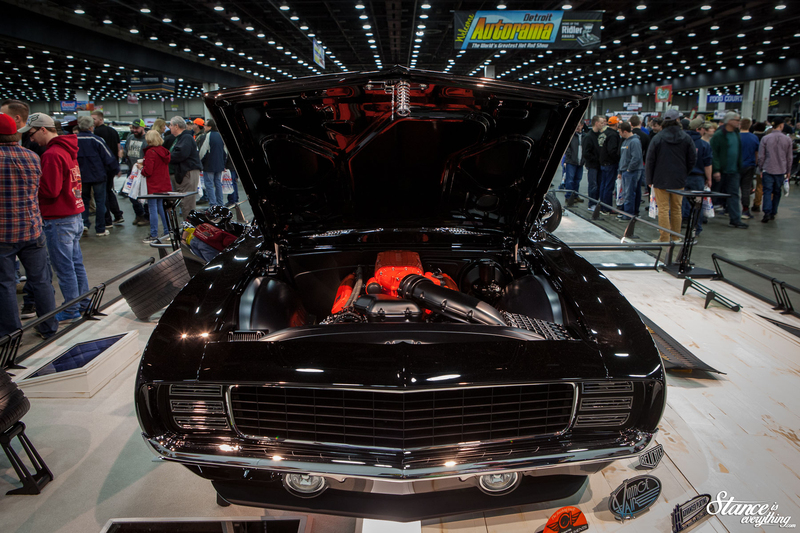 Since Friday of last week I’ve been living and breathing the Detroit Autorama. Once again having the opportunity to cover the show for Rod Authority I made the best of it shooting nearly non stop for two days. I am actually still working through most of my photos so most of my in-depth event coverage will end up over there. 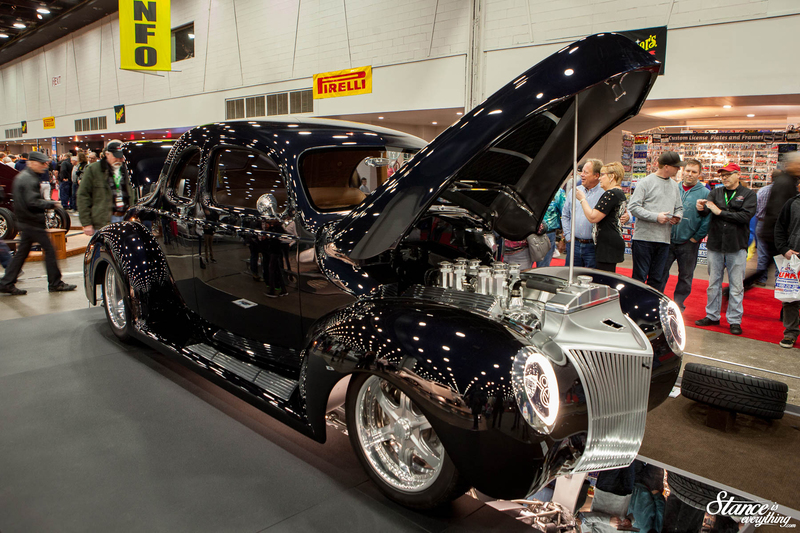 However I have wrapped up my articles on the Great 8 and Ridler winner. This means I’m free to post some of my “b-Roll” here. 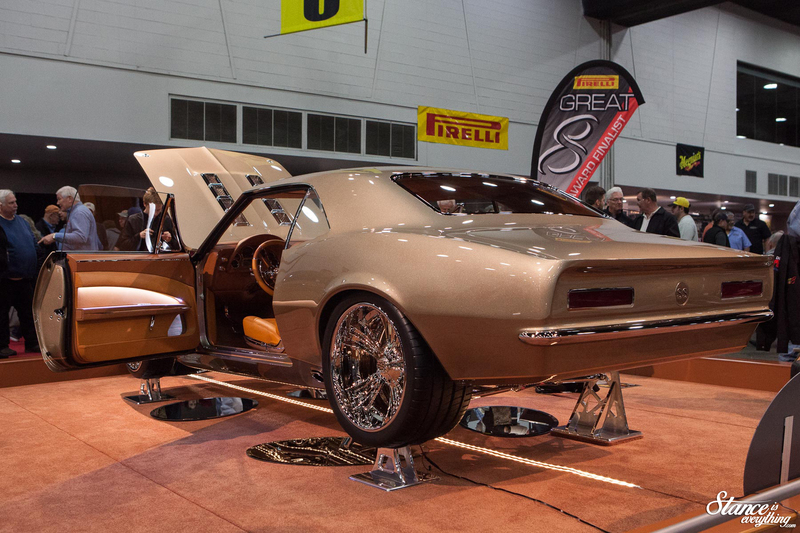 There were two Camaros in the running for the 2018 Ridler award. This was pretty cool because it marks the first time in recent memory where two of the same model made the Great 8. Nickleback is a 67 Camaro owned by Chris and Greg Allen. 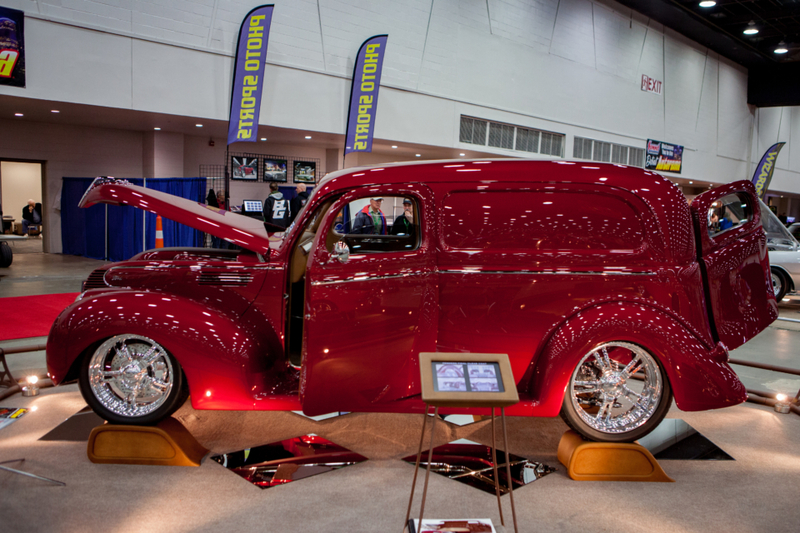 The car was built by Superior Autoworks and despite having a tragic name was a darn nice build. 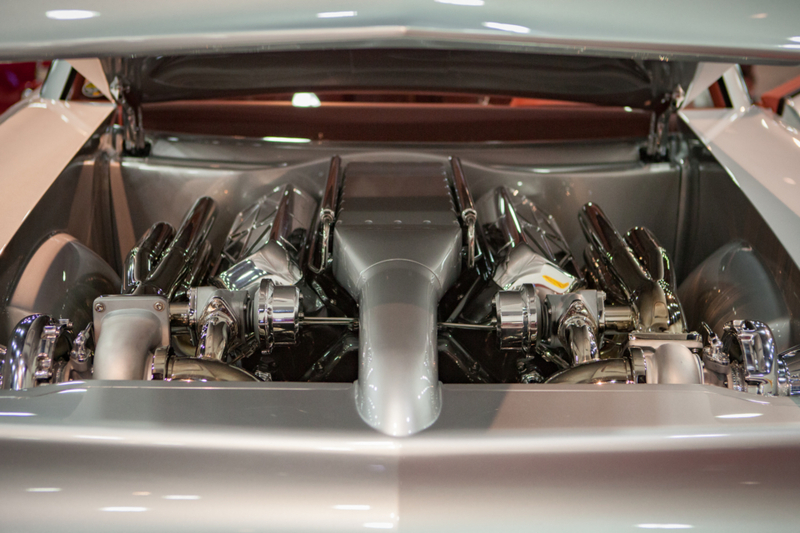 Under the hood is a Magnuson supercharged LT1. 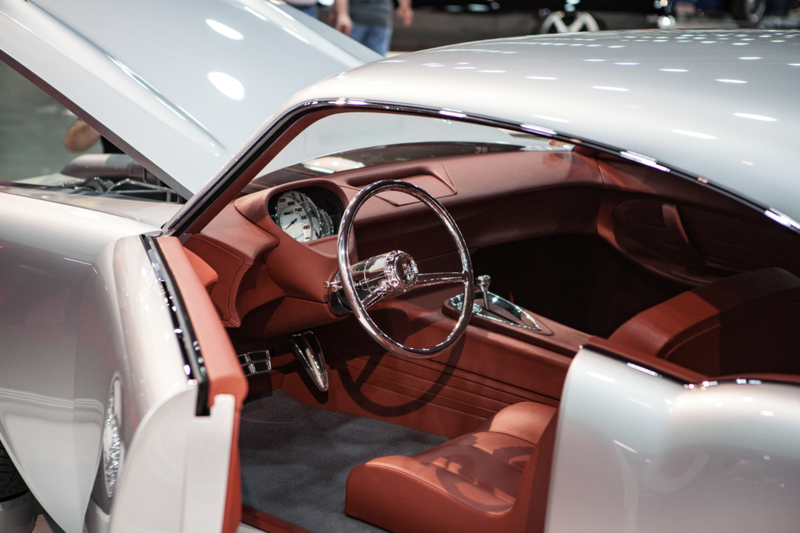 The color is custom, and attributes to the cars name, and every bolt was custom machined. 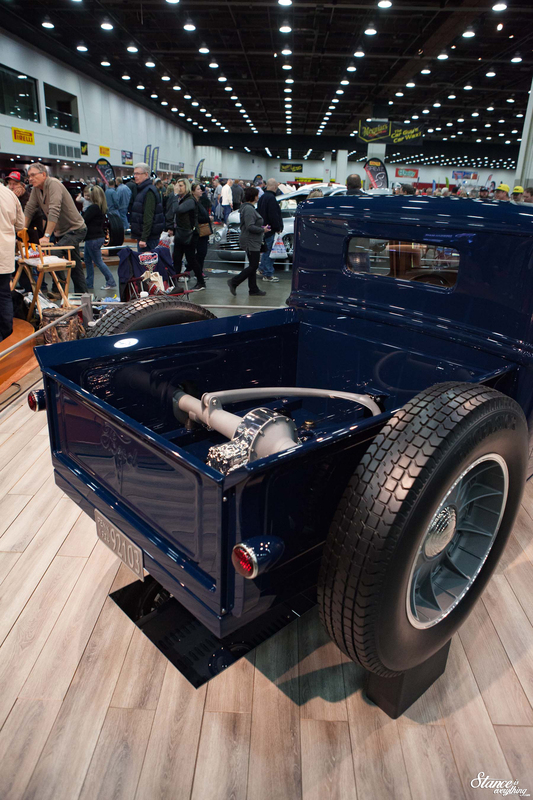 The only delivery in the bunch, this Ford was built by Hot Rod Construction and owned by two car show veterans. This car was incredibly nice, but I thin being a delivery left a lot of people hot or cold about it. 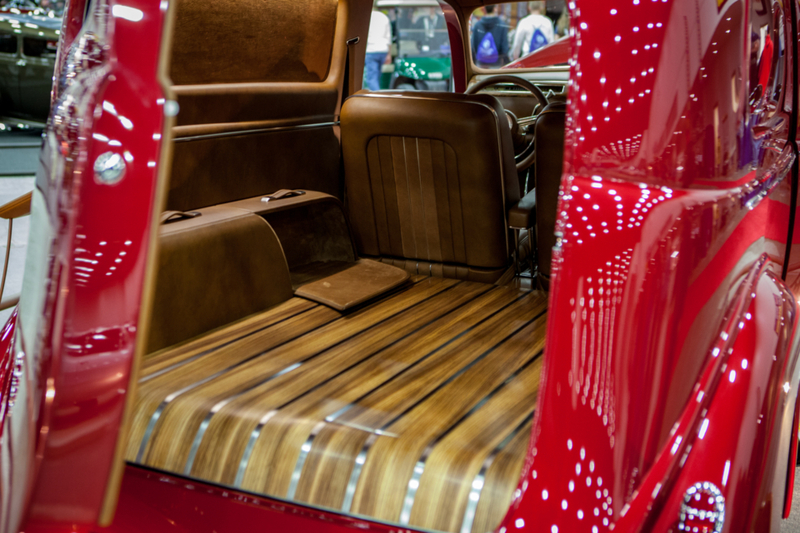 Though the fact it was a delivery did allow for the use of Zebra wood in the cargo area. Hauling anything with this delivery is out of the question but it looked great. A Ford motor doesn’t power this delivery. Instead power comes from a 5.7 liter Hemi. Trick. This Ford had a pretty cool story behind it. It’s actually the first car that the owner K. Reid ever purchased. He modified it a few different times over the years before deciding to take things to the next level. 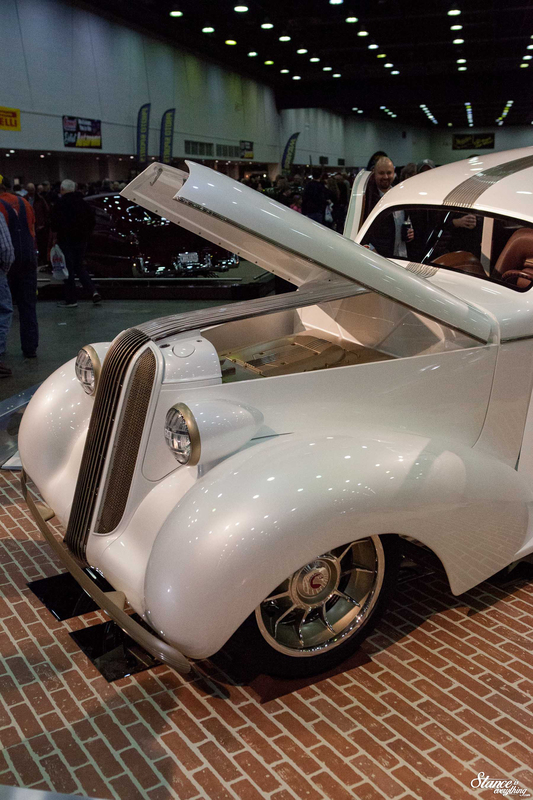 This one was built by Farrel Creations and Restorations. Today it sits on an Art Morrison chassis and is fit with a ZLI big block. 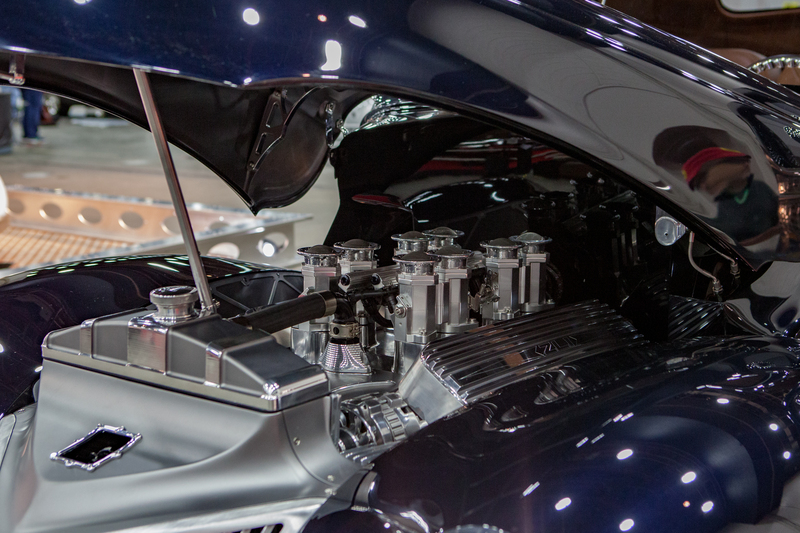 The motor was topped with a great looking induction system and was surrounded by polished aluminum and custom filler panels. 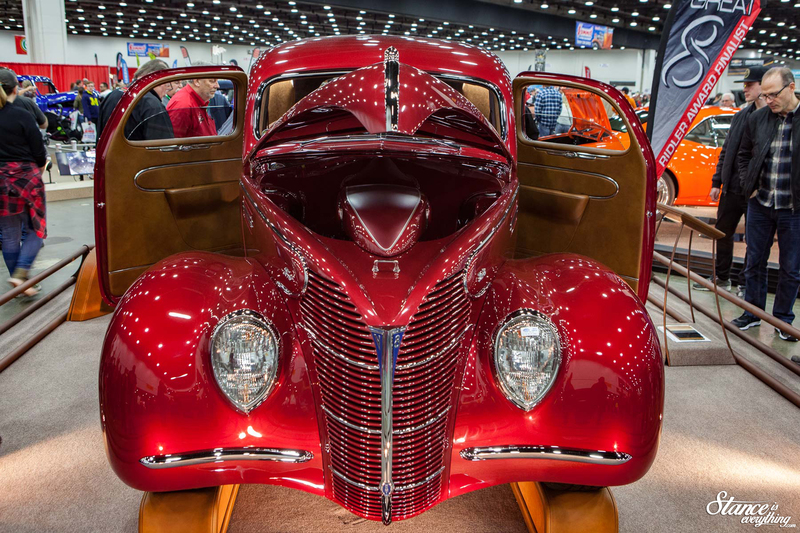 The Art Morrison chassis was smoothed, and painted with equal care as the exterior and the mirrored display showed it off well. 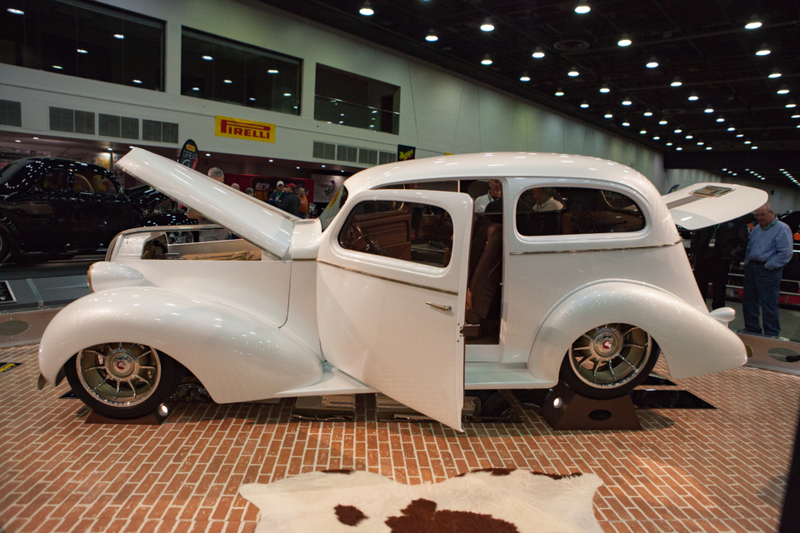 This ’36 Pontiac Sedan was my wife’s pick of the bunch. It wasn’t a bad choice at all and I really thought it stood a great chance of winning. 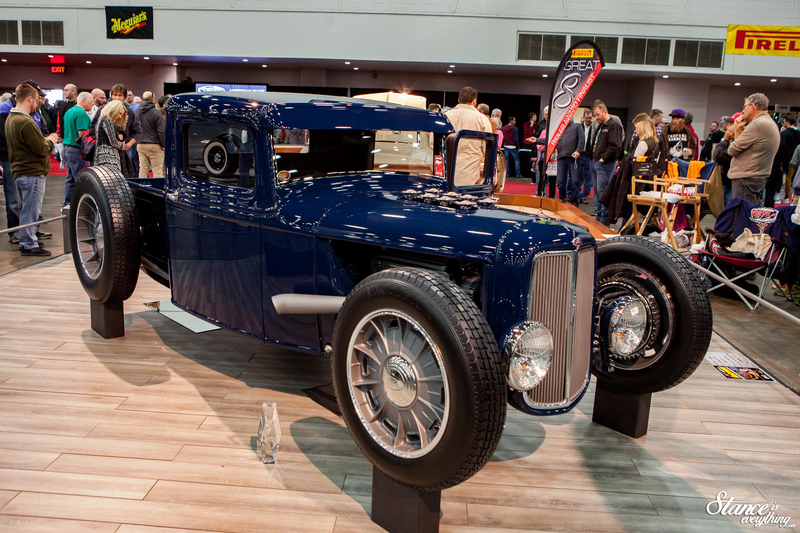 Legens Hot Rod shop set out to build a car that stood out without being over the top. Refined detail was the hook with this Pontiac. It looks simple at first glance but in reality is anything but and the more you look the more you see. The coolest thing to me was the trim that started from between the grill and carried up and over the roof. It was a great defining feature. 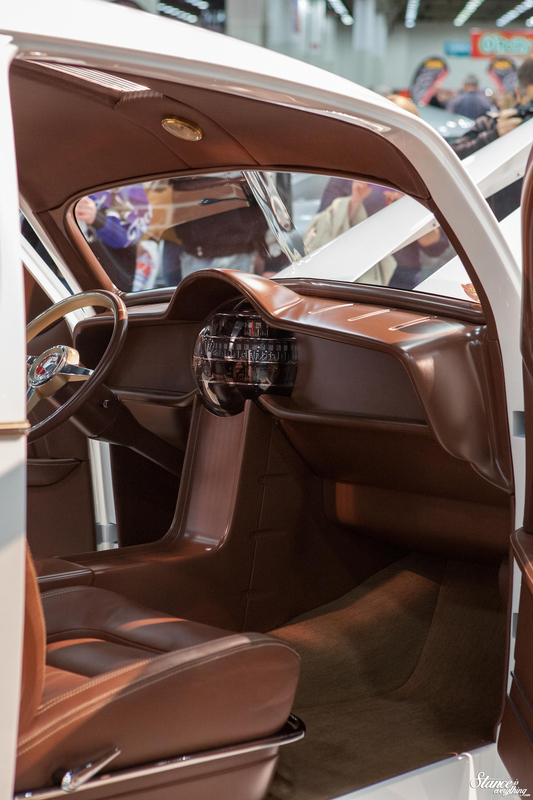 My wife on the other hand really enjoyed the combination of pearl white paint, gold, and brown leather. Inside the interior was as one might expect, flawless, and featured one of the more interesting gauge clusters I’ve ever seen. It’s a globe shaped piece with numbers that rotate around it. 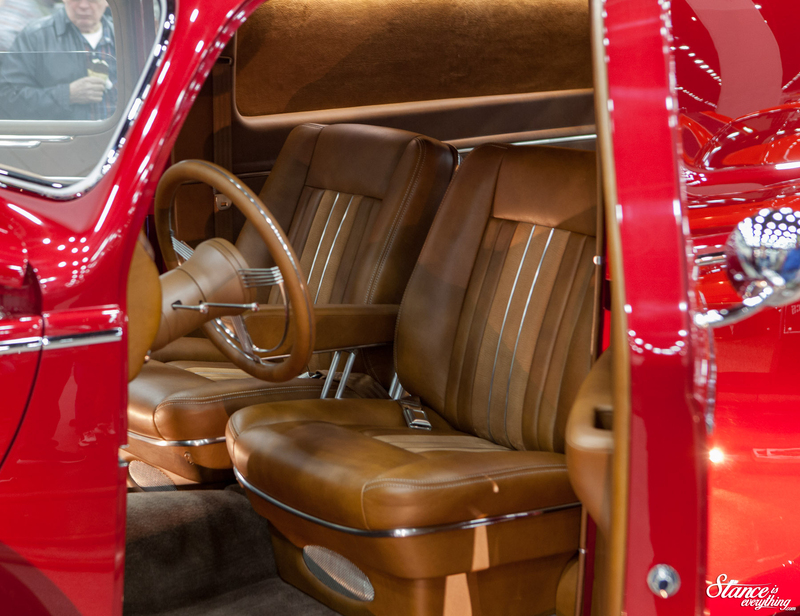 It was built by Autometer and is the only one of its kind. After talking with the owner I don’t imagine they will be building another as it was quite intricate. 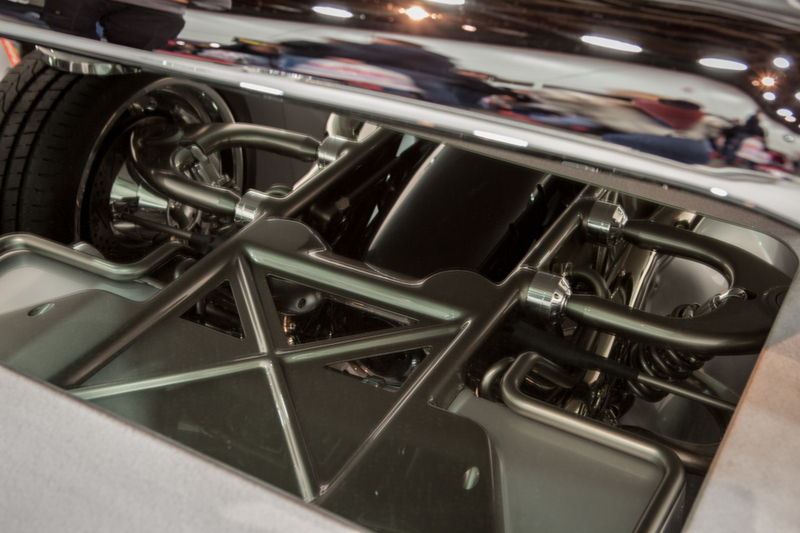 Power for comes from a supercharged LT4 and like everything else the underside is as clean as the topside. 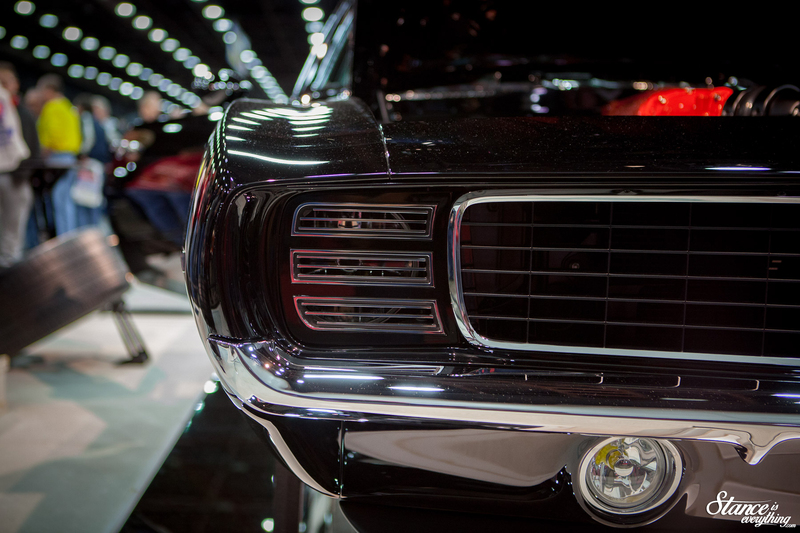 Tux, the second Camaro of the bunch, was absolutely mean. Built by Detroit Speed, Inc it was incredibly clean throughout and maintained most of the factory Camaro lines. The stance was on point and the car tucked Forgeline wheels phenomenally. 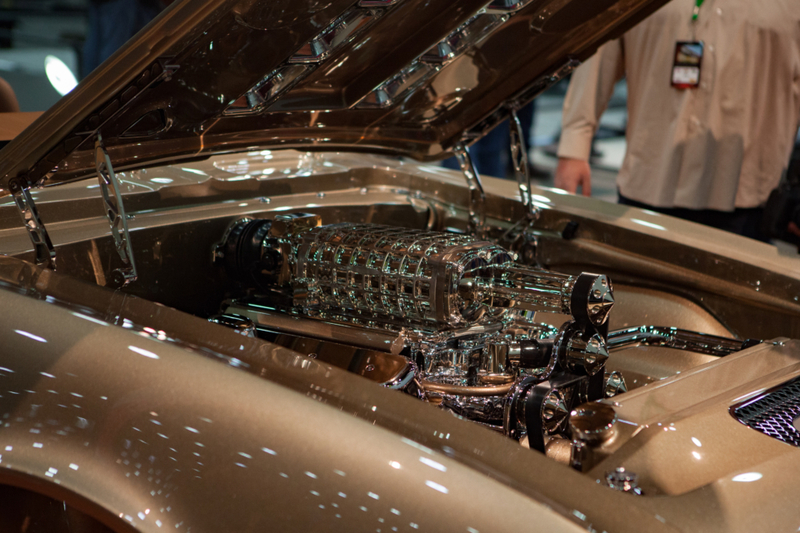 Under the hood was a Harrop Supercharged LS. 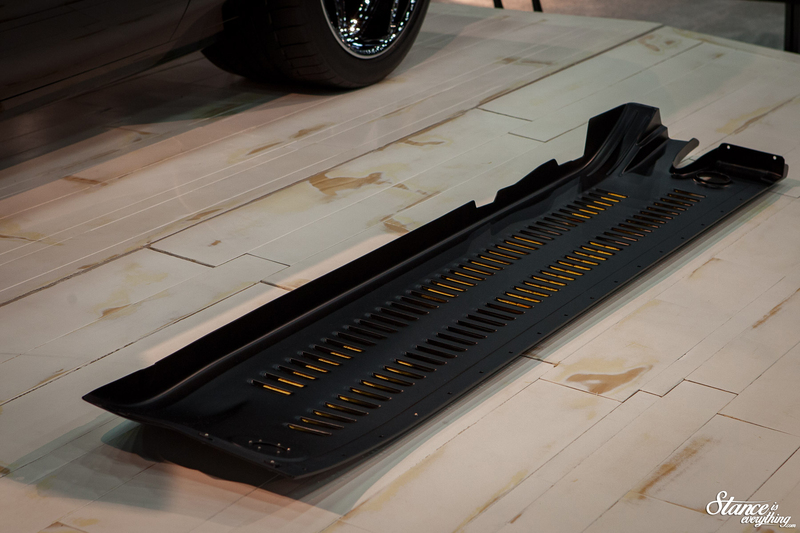 There were a lot of billet parts uses throughout (like the headlight covers) and Detroit Speed made a number of covers for the underbody. One of which was removed and placed beside the car for display, shown above. I can’t imagine the number of hours that goes into a piece like that. 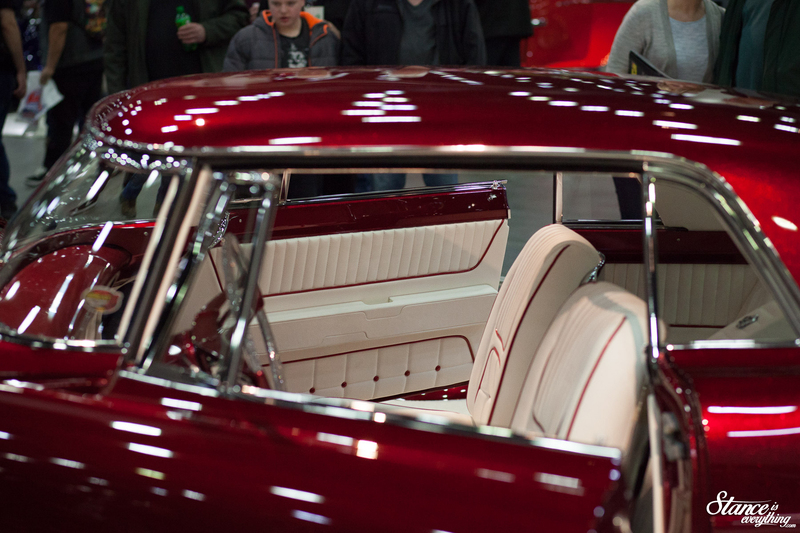 You guys already know that I am a sucker for metal flake and this Lincoln had miles of it. The Scarlet Lady was actually the very first car I took a photo of when I walked into the venue. It was also the only car not on stands for most of the event. 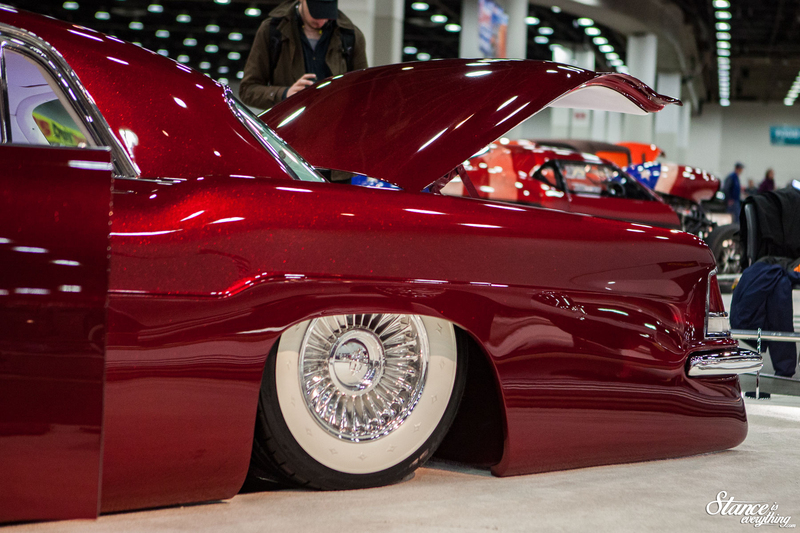 The builders mentioned this is because a kustom belongs on the ground. Another bonus point in my books. 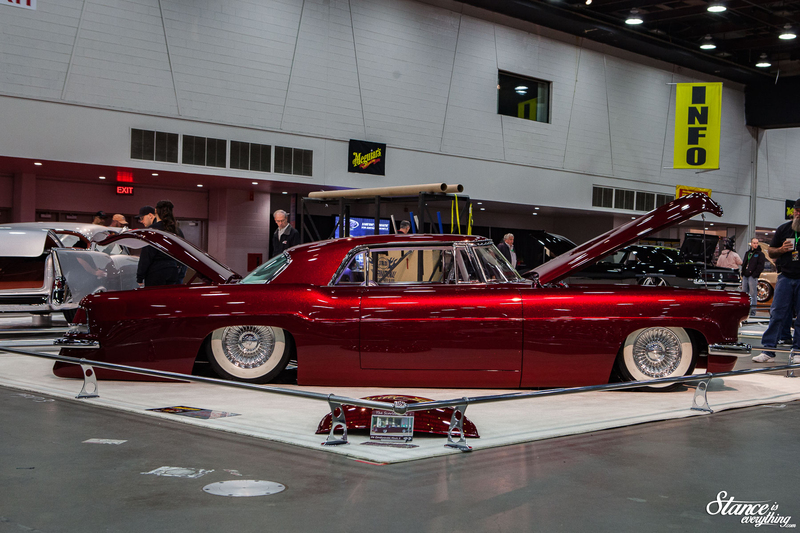 The car actually belongs to Chris Ryan, the owner of Ryan’s Rod Shop and he plans to drive the Coyote powered Lincoln after it does a small show tour. 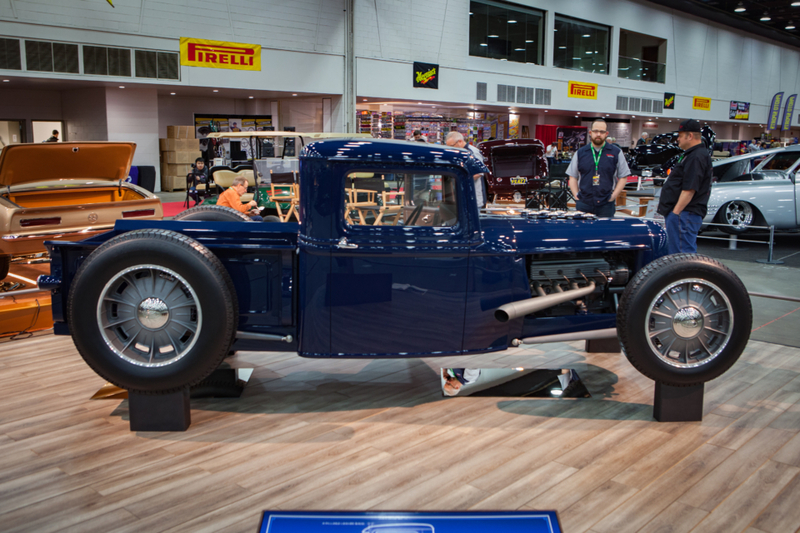 The only traditional hot rod in the bunch Jason Graham Hot Rods built this all steel 1934 Ford. A lot of people were pulling for this truck to win, and honestly if it wasn’t for the Lincoln, it would have been my pick as well. 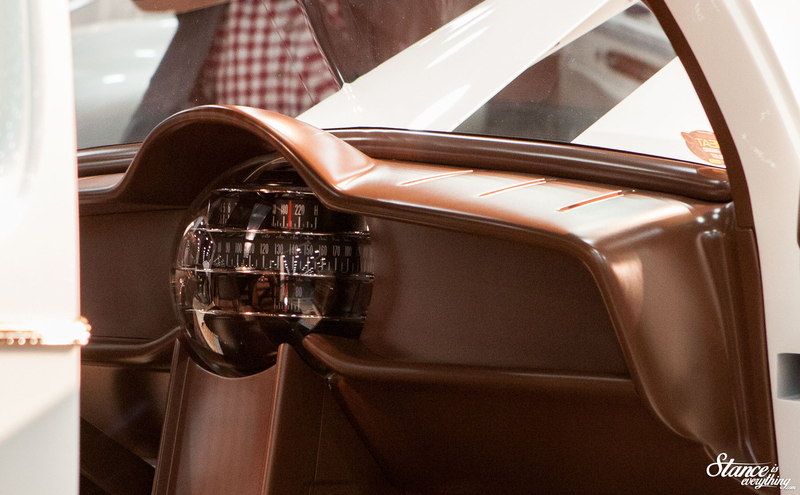 Side profiles are a big deal, and this Ford had one of the most attractive side profiles of all the cars entered. This is thanks to numerous body mods. The roof was chopped 4.5 inches and the a pillars were leaned back to give it less of a boxy look. The cab was also lengthened which helped the proportions out. 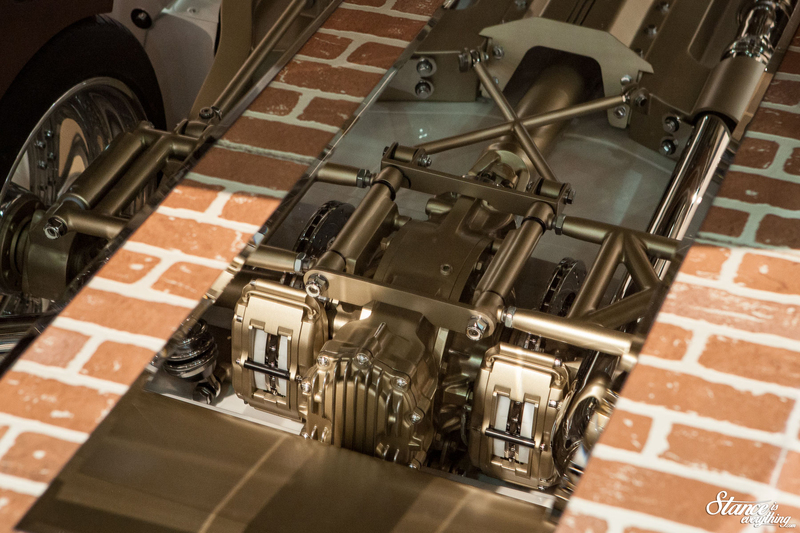 One of the coolest features, in my eyes anyway, was the axle running through the bed. Pretty trick touch executed beautifully. When it comes to sheer number of modifications “Imagine” was the clear winner. It’s a 57 Chevy, but hardly looks like one at any angle. 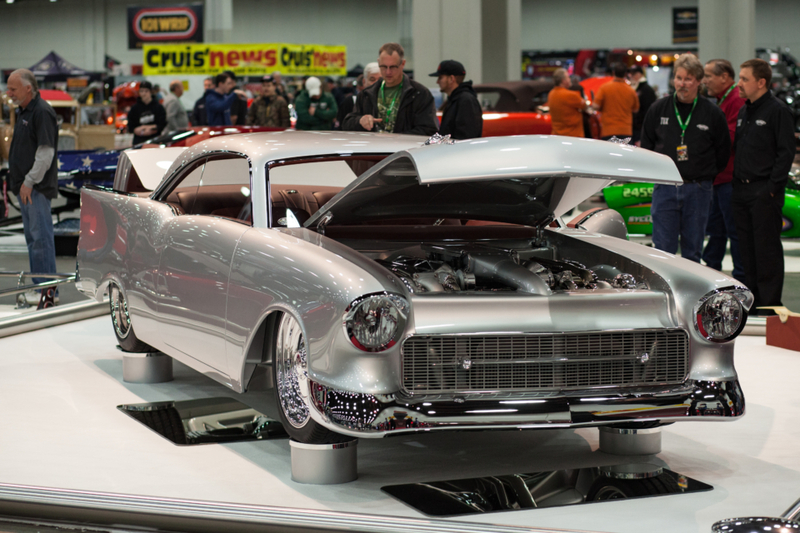 Chopped, channeled, and wedge sectioned “Imagine” is a much lower profile car than the ’57 Chevy ever was from factory. 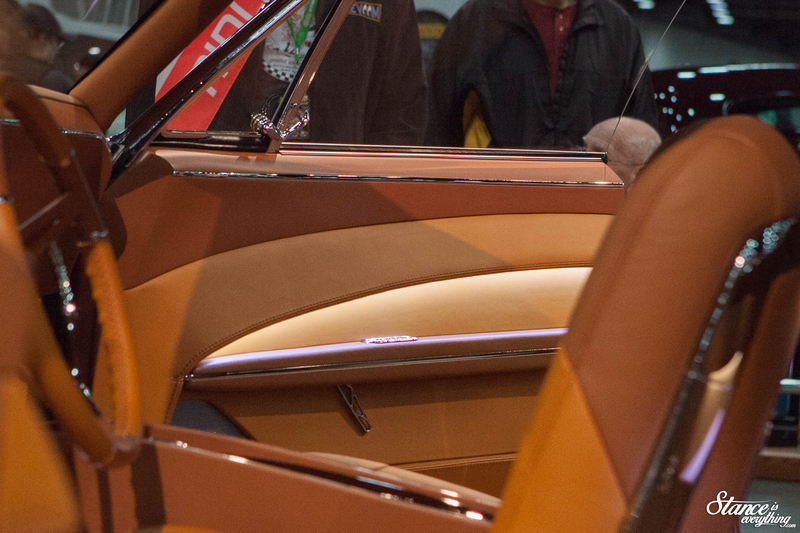 This, along with the missing side trim, meant made it a bit of a controversial pick among die-hard tri five fans. Regardless of visual preferences two things put this car over the top. 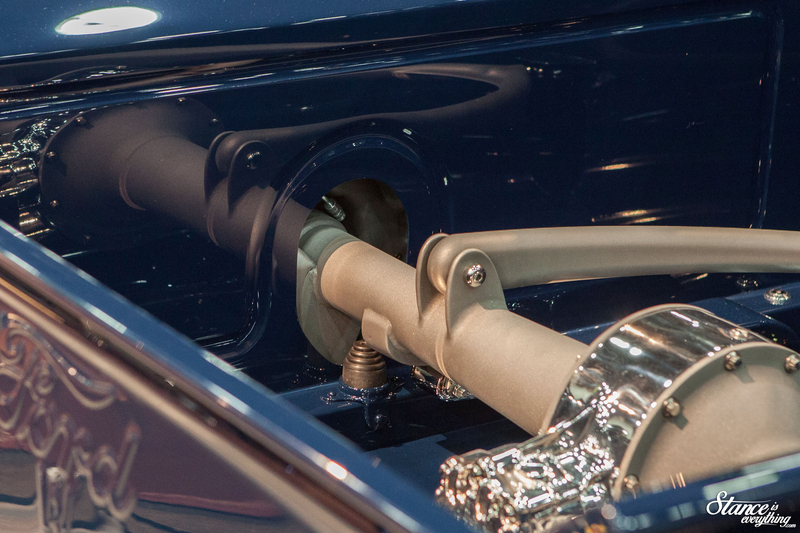 The first was the fact that all of the joints on the car were connected via billet machined ball and cup sockets. More often than not these ball and socket joints were mated to custom components, like the control arms above. The other feature that put it over the top was the absoluteness ridiculous Nelson Racing Engines designed twin turbo big block. 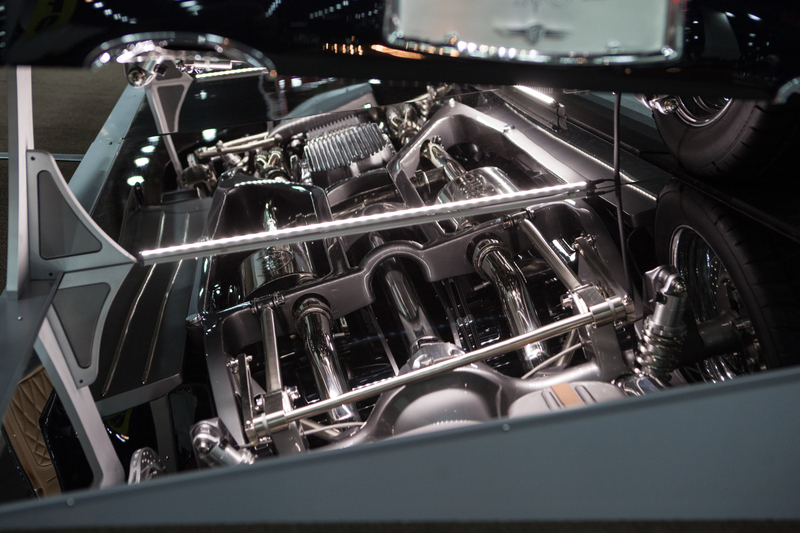 It was designed to be an “enclosed” system which meant you couldn’t see any serpentine belts, or wiring, or anything of the like. It did all that while making over 1000 horsepower. At an event like this not everyone is going to be happy with the winner, but if you had it your way which would you have put on top? Would it have been Imagine? Would it have been any of the cars on this list? We can certainly agree there is too much arrogance (and ignorance) out there. And my first car was a Camaro and I still like the Camaro a lot!especially the current SS and ZL1. I also like the Mustang GT (and own a 12 GT coupe w/ mild Steeda mods) as I believe American pony cars, including those from FCA, are great value for dollar and great cars. This great value also surely includes the Corvette! Pretty wild cars. The level of customization is insane. My favourite is the 34. That rear end is gorgeous. Looks like it’s floating in the bed. Where are the springs? 1/4 leafs under the axle? Hard to tell.